"One of the most profound influences in the formation of the Canadian identity has been the country's largely unknown and unsung national news agency, according to a just published book," Colin Perkel writes. "In his detailed historical account, author Gene Allen traces the American-midwifed birth and first seven decades of Canada's single most important news supply company, The Canadian Press, familiarly called CP. "The book, "Making National News: A History of Canadian Press," spans a period from the early 1900s to 1970 — when new-fangled multiplex telephone systems rendered the telegraph as the primary news-distribution network essentially obsolete. Toronto police have opened an internal investigation into the January arrest of radio host John Downs, who says he was taking pictures of a bloody scene when police arrested him, the Star reports. Downs took to the airwaves to tell his story Monday night. He said he was arrested on a Friday in January after he stopped to take photos of a scene where emergency crews were working. He said he was charged with public intoxication, but the charge was later dropped in court. It has since come to the attention of Toronto police, who have opened an investigation into the matter. “In this case he came to us with information and Professional Standards has taken it up and they’re in the process of investigating,” said Toronto police spokesman Mark Pugash. He declined to elaborate on the situation, citing the ongoing investigation. Downs co-hosts Friendly Fire on Newstalk 1010. with Ryan Doyle. "It’s a scandal that has shaken London’s newspaper business, caused widespread public outrage and brought down one of Britain’s best-selling tabloids. And now a criminal trial has begun in London into the heart of the allegations: that senior editors at Rupert Murdoch’s media empire allowed staff to hack cellphones to get stories, bribe public officials and block a police investigation. "The trial is among the most sensational in years in Britain and is expected to not only probe the inner workings of the once mighty News of the World, which closed in 2011 because of the allegations, but also expose the complicated ties between reporters, politicians and the police at some newspapers. "Among the eight defendants on trial are Andrew Coulson, a former News of the World editor who was also once a communications adviser to Prime Minister David Cameron, and Rebekah Brooks, a former editor of the News of the World and the Sun who also served as chief executive of Mr. Murdoch’s British newspapers. . ."
Twitter Inc has set a relatively modest price range for its closely watched initial public offering, but some financial advisers say their clients are not clamoring to invest in the social media phenomenon, Reuters reports. "Nary a tweet," says William Baldwin, president of Pillar Financial Advisors in Waltham, Massachusetts, when asked about client interest in the deal. Out of 29 broker-dealers and independent advisers contacted by Reuters, 23 said they are not recommending Twitter shares. Only one said he would recommend it - and only to certain clients. Five others said they would wait to snap up the stock if it plunges after it begins to trade on the New York Stock Exchange. While retail interest might be low, tech industry analysts say there is expected to be a good appetite for Twitter stock from institutional investors at the current valuation. Actual institutional investor sentiment still remains unclear. Retail investors typically account for 10 to 15 percent of IPOs. Postmedia Network Canada Corp. posted a $36-million loss in the last quarter, citing weakness in all of its major advertising categories. The publisher of metropolitan newspapers has been restructuring for a year as it tries to get a handle on decreasing print revenue and increase its digital revenue. Postmedia is perhaps the most vulnerable of all the Toronto daily publications -- including the Globe and Mail and the Toronto Star -- which face the 21st Century digital newspaper curse. For many years, analysts have predicted a rationalization of this business which would see fewer daily papers in Toronto. Prime Minister Stephen Harper defended himself in question period on Wednesday against accusations made yesterday by Senator Mike Duffy in the ongoing Senate expenses scandal. Harper denied Duffy's allegation that he was more concerned about the perception of Duffy's expenses in the media than whether they violated parliamentary rules because the expense rules were “inexplicable to our base." "The issue is not a matter of perception … you can not claim an expense you did not incur. That is not right, that is not proper, and that will not be tolerated in this party," Harper said during question period on Wednesday. Harper reiterated his position that he knew nothing about the $90,000 cheque Nigel Wright, the prime minister's former chief of staff, gave to the senator to repay his ineligible expenses. "Any assertion that I was in any way consulted, or had any knowledge of Mr. Wright's payment to Mr. Duffy, is categorically false," Harper said. Good entertainment, isn't it? Wonder when they will get back to running the country? After receiving several complaints, the federal privacy commissioner’s office is launching an investigation into Bell Canada’s attempt to collect data on users’ TV and web habits and telephone patterns, the Star reports. Following strong customer reaction and criticisms from a consumer group and the federal New Democratic Party, Bell sent out a news release Wednesday explaining why the company wants to collect this data beginning on Nov. 16. Bell says the move will benefit customers who will see ads targeted to their interests. Bell stands to gain from the changes, as the telecom giant will be able to better compete with world players like Facebook and Google, the company said in the release. The program is designed to deliver “online advertising that’s most relevant to” customers, according to Wade Oosterman, president of Bell Mobility and Residential Services. Mike Duffy: The PM ordered me! Senator Mike Duffy launched a strident defence on Tuesday in the Senate against a motion that would see him suspended, along with Senators Pamela Wallin and Patrick Brazeau from the chamber, and their pay and benefits cut. Describing a meeting with Prime Minister Stephen Harper and his then-chief of staff Nigel Wright, Duffy described Harper as saying: "'It's not about what you did. It's about the perception of what you did that's been created in the media. The rules are inexplicable to our base' … I was ordered by the prime minister [to] pay the money back, end of discussion." The Prime Minister’s Office pressured Sen. Mike Duffy to repay ineligible housing expenses and fed him talking points on the matter in an effort to make a story that had become a political liability go away, Duffy’s lawyer charged Monday. During an almost hour-long press conference in Ottawa, Donald Bayne told reporters that both Senate leadership and the Prime Minister’s Office had cleared Duffy’s housing claims for his home in Prince Edward Island. But as scrutiny over senators’ living and travel expenses grew, the PMO began orchestrating a campaign to get Duffy’s expenses out of the headlines, Bayne said. Mayor Rob Ford and his brother are defending their weekly radio show, saying it is about “reaching out to the community,” not scoring political points, the Globe and Mail reports..
"Less than two weeks ago, Prime Minister Stephen Harper sent a shiny makeup compact to a U.S. journalist. "This week, his party was picking fights with reporters on Parliament Hill and then slamming them in fundraising letters to the Conservative base. "Clearly, this is a prime minister with mixed feelings about the media. "That’s not news — in my 25-plus years here, no prime minister has displayed any overt fondness for reporters. "But while other prime ministers regarded journalists as a necessary evil, Harper has spent considerable time and energy trying to prove they are unnecessary. And unlike other prime ministers, he has more tools at his disposal to detour right around the pesky media pack. . . "
The Star reports that Sen. Pamela Wallin is preparing to fight a bid by her former party to have her suspended without pay — a gambit her lawyer calls an affront to Canadian democracy designed to help the Conservatives change the channel. “It is backroom politics at its transparent worst and it’s designed to create the impression of a clean slate for the Tory convention in Calgary next week,” lawyer Terrence O’Sullivan said in an interview Friday. Senate motions are set to be debated that would suspend Wallin, Mike Duffy and Patrick Brazeau for “gross negligence” for the rest of the parliamentary session, which could last two full years. The three former members of the Conservative caucus were found by the Senate to have filed improper expense claims following independent audits. Harperites ban journalists from PMs speech; cameras only, please! After barring reporters from covering one of Prime Minister Stephen Harper speeches, the Conservative Party is decrying a “new low for the Ottawa media elite” because some TV cameras refused to film the event if reporters weren’t allowed inside, the Globe and Mail reports. On Tuesday, the Prime Minister’s Office announced cameras would be welcome inside Wednesday morning’s speech, but not reporters. In the past, both had. And the PMO has clashed recently with people trying to ask questions. One CTV cameraman was reportedly nearly banned from an overseas trip after shouting an impromptu question during one Harper event, while during the summer the RCMP whisked away a reporter who tried to seize a microphone during Mr. Harper’s Northern trip to ask a question. On Wednesday, some TV stations refused to send in cameras without reporters. Most other media, including newspapers, were never offered the chance to come in at all – and therefore never given any opportunity to cover the speech live, much less boycott it. The Globe and Mail reports that the Ontario Press Council has ruled the Toronto Star was right to publish a report about a cellphone video that appears to show Toronto Mayor Rob Ford smoking crack cocaine, without actually having a copy of the video in its possession. The news organization was called before the council to justify its use of anonymous sources and to explain why it published the story about the video without further proof. The council said the paper did everything it could to verify the video’s contents, and had an obligation to report what its reporters saw despite the lack of evidence. “[The] council is of the view that the Star reporters were thorough in analyzing the video and came to a reasonable conclusion in deciding that it was a video of Rob Ford,” the council wrote in its decision. The New York Times Co. has rebranded its Paris-based daily, the International Herald Tribune, as the International New York Times — a bid to lure readers abroad amid the upheaval of the digital era facing traditional newspapers. Before the Times bought it the paper was known as the Paris Herald-Tribune. 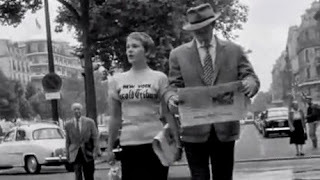 It was immortalized in the French New Wave movie "Breathless," starring Jean Seberg and Jean-Paul Belmondo. (see pic) Executives say the rechristening Tuesday aims to get the most out of its brand, and complete a gradual fusion of the newspapers' editorial staffs in recent years. The Times took control of the IHT a decade ago by buying the stake of its co-owner, The Washington Post. Worldwide subscribers to the Herald Tribune — with a print circulation of 224,000 and distribution in about 135 countries — woke up Tuesday to a similar-looking newspaper. Novelties include a new masthead, enhanced Page 2, and opinion pieces by dozens of new international columnists. Europe editor Richard W. Stevenson said the rebranding is really about going digital and reaching out to readers abroad. "(Les) Pyette knows talent and nurtures it. "Pop culture has always been his secret weapon. "Stories on how people are affected by politicians were more interesting to him than the politicians. He likes stories about how a trainer taped up a player’s knee to help him score the winning goal better than a piece on the final score of a game. "He despises press releases or press conferences but instead loves stories from the street about cops, firefighters, paramedics, the homeless, the heroic or brave. Mostly, he likes to be first." A pair of rulings from Canada's telecommunications regulator paves the way for "a la carte" TV services that would allow consumers to purchase only the channels they want, instead of buying specialty bundles from their cable or satellite operators, the Huffington Post reports. The news will likely be welcome to many consumers who complain they are forced to pay for TV channels they don't want in order to gain access to a few they do want. But under the new rules set out by the CRTC, viewers can expect to pay more per channel if they buy them individually, the Globe and Mail reported Friday. Bell Media president Kevin Crull told the paper that many customers who now pay around 30 cents per channel for 250 channels may see their per-channel costs go up to as much as $1.50. Cable and satellite providers won't be required to provide a-la-carte TV services. Telus, which was involved in a separate dispute with Bell over pricing and packaging, said in a statement to Huffington Post Canada that its ability to sell theme packs at set prices was affirmed by the CRTC ruling. One of the main sticking points ironed out by the CRTC had to do with sports channels. Though they tend to be popular, channels like TSN and SportsNet are generally part of bundled TV packages, and research suggests that if a-la-carte TV were to happen, these channels would see a large drop in subscriptions. For photographer Boris Spremo, induction into the Canadian News Hall of Fame is the crowning achievement of a decades-long award-winning career. Over 37 years, the former Toronto Star photographer won 285 national and international awards for his work, including four National Newspaper Awards. In 1997, he was awarded the Order of Canada. York served a libel notice — the first step in launching a libel lawsuit — to the publisher of the magazine and the author of the article, award-winning journalist Katherine Laidlaw late last month. The unusual action has defamation law experts questioning whether as public institutions, universities are allowed, or should be allowed to sue for libel. The RCMP is alleging that Sen. Mike Duffy awarded $65,000 in contracts to a friend who did little tangible work — the latest wrinkle in the case against the former Conservative. The Mounties filed a production order in an Ottawa court to gain access to bank account records related to the allegation. Between 2009 and 2012, Senate documents obtained by police show that Duffy employed former TV colleague Gerald Donahue to do writing, media monitoring and consulting. But Donahue told police that he didn't do any writing, and never produced any tangible document, report or work product. The RCMP points out that Donahue was a TV technician until 1997, with no consulting experience. Bill Eppridge, one of the greatest photojournalists of his generation and the photographer who famously captured Robert Kennedy’s assassination in Los Angeles in June 1968, died on October 3, 2013. He was 75. Born in Buenos Aires on March 20, 1938, Eppridge moved with his family to the United States early in his childhood, settling first in Richmond, before moving to Nashville, and finally, Wilmington, Del. He began his long relationship with photography early in life, spurned by an unlikely motivator: sibling rivalry. “I have this older sister who has always been a very fine artist. She draws, paints, sculpts — and I can’t draw a straight line. I wanted to do something so I could compete with her. So I went to her and asked her to show me how to use a camera,” Eppridge told the Danbury News Times in 2011. By high school, Eppridge was shooting for his school newspaper and yearbook. By age 15, he earned a spot as a sports photographer at the local paper, the Wilmington Star. After initially studying archaeology at the University of Toronto, Eppridge transferred to the University of Misssouri’s famed journalism school, where he graduated in 1960. Upon graduation, Eppridge immediately found good fortune: a photo of his was awarded first prize in the pictorial category of the 1959 NPPA Pictures of the Year competition. Coupled with his achievement of being named the College Photographer of the Year, Eppridge was offered an internship at LIFE — the start of a storied career with the famous magazine. John Honderich says the federal Conservatives have gone to unprecedented lengths to control the news agenda. The PMO wanted to prevent a CTV camera from boarding Harper's plane to Malaysia because he had the temerity to ask Stephen Harper a question last week.